RateMyDeal.com | Ibotta: Get Cash Back Bonus After First Rebate (New Users Only!) & Get Paid To Buy Milk! Ibotta is an app for your Android or iOS device that gives you cash back after your purchase qualified items and send them a picture of the receipt, some stores are even easier like Food Lion where you just link your MVP card and no receipt pictures are necessary. Right now Ibotta is offering a new user bonus if you redeem a qualifying offer within 10 days of downloading and installing the app. 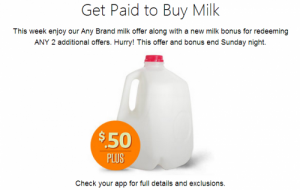 Lately they have been offering $.50 off any gallon of milk at any of the participating retailers, that makes for a super easy first offer for you to cash in on and give Ibotta a try. Remember the sign up bonus is only for NEW users but the 50 cents off a gallon of milk offer is for everyone. RateMyDeal.com Podcast – Episode 9: Black Friday and Cyber Monday Talk! Breaking News Update: CVS and Supermarket Card deals = $150 Money Maker! !